Hello! Hope everyone is having a lovely Indian summer– we were all outside barefoot after dinner tonight, so amazing. I’ve been having a hard time lately because yesterday we found out Wilson’s tongue has partially reattached, which explains why he doesn’t have the tongue mobility necessary to eat solid foods (they get stuck on the roof of his mouth and he can’t scrape food off using his tongue because his tongue can’t touch the roof of his mouth anymore). I’m trying to remember he’ll be okay because he can take a bottle, but my brain keeps going back to how scary it was when he was Failure-to-Thrive and all the doctors in Charlottesville kept blaming me for his lack of weight gain… anyway, until we get his tongue cut (again, sigh, except this time I think we will go see a tongue tie specialist out of state) I will probably be an anxious wreck. So to distract myself, I thought I would share an overdue tidbit with y’all: we got 2 new chickens! 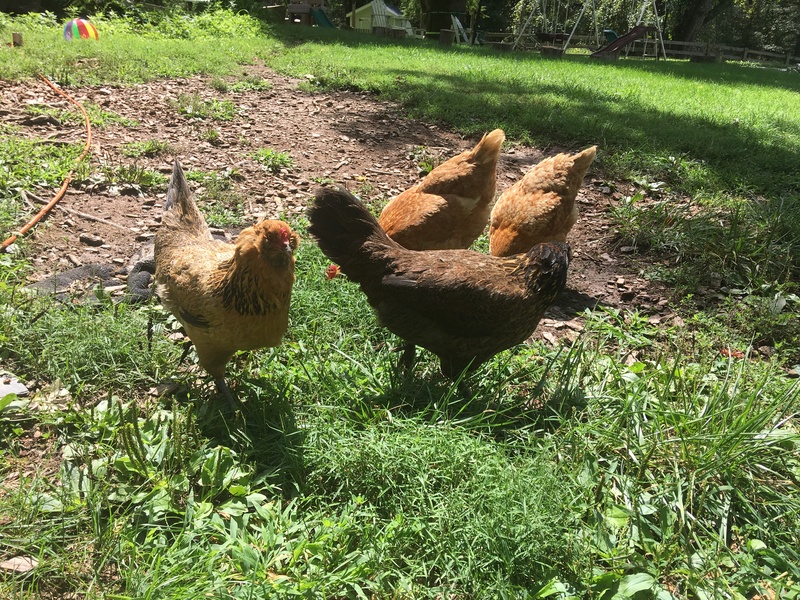 My friend Meredith (https://www.willowhillfamilyfarm.com/) gave us 2 hens that were part of their wild surplus– and they are AWESOME! One is all black and one is half-black, half-orange/tan. They’re quite beautiful. 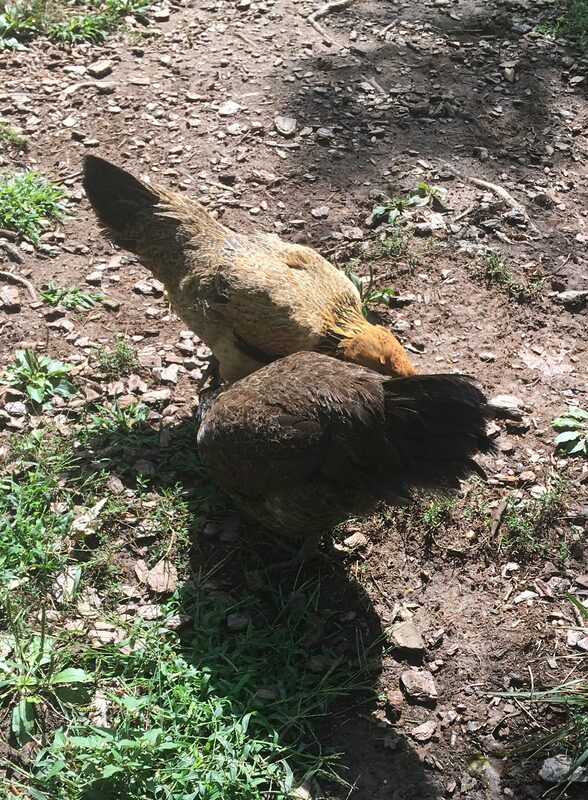 At first our 2 red hens were very rude and pecked the back of the all black one’s head until it lost its feathers and bled. But after a few months (yes, they’ve been with us since May, oops! Sorry for how overdue this is!) they started all hanging out together as one flock. 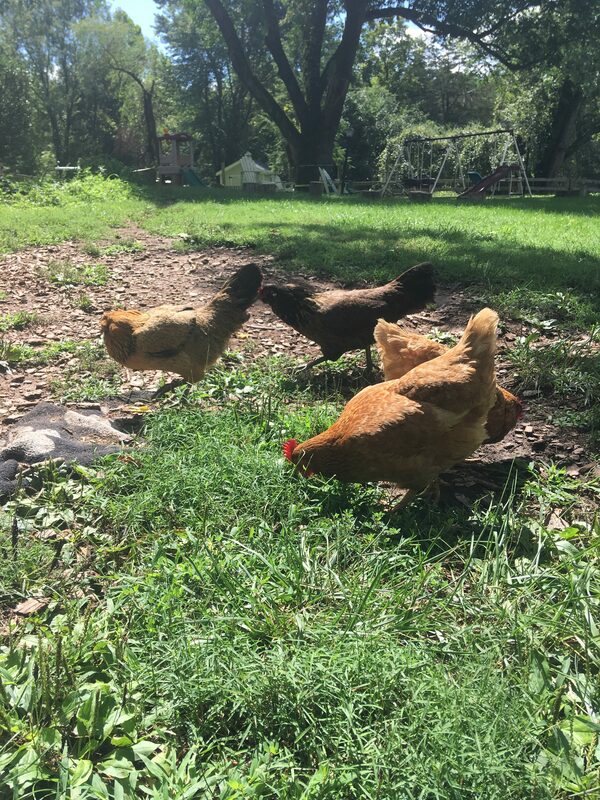 While the 2 veteran reds (we call them “Red 1” and “Red 2”, creative I know) still rule the roost, literally, the 2 new chickens are permitted to eat now. For a while after they first moved in here, Red 1 and Red 2 would peck the newbies any time they tried to eat anything. It was a brutal welcome! How cool is that! 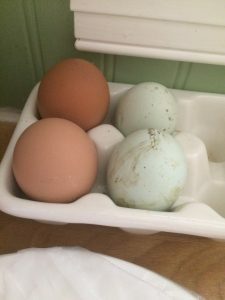 Red 1 and Red 2 each lay brown eggs (one is always darker than the other) and the 2 new chickens lay the same beautiful pay blue color. Collecting eggs is so much fun now! They taste the exact same, in case you were wondering. We’ve done a blind taste test, not even kidding. My friend has 13 chickens. Fun watching them run around eating tidbits they find everywhere in their run. I always have fresh eggs,too. Blue ones are so pretty. I hate to break them to eat. But, there are more where they come from. My granddaughter, Emma, loves to visit and hold one. Some like being held and petted. So, enjoy the chickens and their fresh eggs.